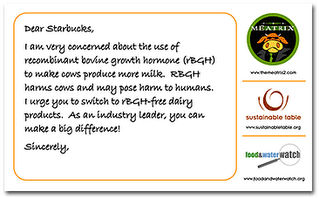 Nowadays, many dairy farms inject cows with rBGH (recombinant bovine growth hormone), a genetically-engineered, artificial hormone used to make cows produce more milk. In the United States, rBGH is given to about 22% of cows. It is banned in Canada, Japan, Australia, and the European Union. On December 5th, Food & Water Watch is asking people to call Starbucks at 1 (800) 235-2883 between 5 AM-6 PM (PST) and request that they guarantee that all of the milk, chocolate, ice cream, bottled Frappuccino drinks, and baked goods that they serve are free of rBGH, also known as rBST. If you are more of an emailer, Democracy in Action has a form email that you can edit, or send as is. Why should we care? Well, according to Food & Water Watch, rBGH increases the risk of infections in cows. When cows have infections, they are treated with antibiotics, which we drink, and those antibiotics can contribute to our being resistant to antibiotics in the future. Also, rBGH increases a hormone called IGF-1 in cows that is linked to an increase in colon, breast and prostrate cancer when humans have too much of it. Finally, Stabucks is such a huge company, if it only bought organic milk, that could have a huge impact on the organic dairy industry. They also have an interactive map that shows you where you can buy dairy products without artificial bovine growth hormones and an rBGH-free dairy list you can take with you on your iPod when you go shopping. Finally, if you are a blogger who wants to spread the word, they've asked that you tag your post with the tag: holdthehormones, and they have web banners that you can add to your post available here. While window shopping in our neighborhood this weekend, my husband and I went into a store that was selling the beautiful handmade bag pictured here. A card propped up beside it explained that it was produced by a company called, Be Sweet. Most of Be Sweet's products are made by artisans who work in job creation programs in South Africa. They sell hand-knit scarves, shawls, hats and throws, hand-crafted bags and jewelry, hand-spun and dyed yarn, knitting patterns and Be Sweet tanks and tees printed on American Apparel T-shirts. You can find a store near you that sells Be Sweet products here, and if you are a knitter, they've posted a free pattern. Last week I posted about the online fair trade store, Global Girlfriend, here and on BlogHer, and asked readers to post other ideas for do-good gifts. One reader suggested the Amber Chand Collection that features gifts by craftswomen who live in regions of conflict and post-conflict. My dad (!) suggested two sites related to the Museum of New Mexico Foundation (who he works for)-- New Mexico Creates, that features the work of 400+ New Mexican artisans and artists, and Worldfolkart.org, that sells work by international artisans. If you have more ideas for do-good gifts, please post them here. You can also check out some other ideas myself and Have Fun * Do Good readers had last year here, here, here and here. Photo credit: Shelley Big Bag from Be Sweet site. Hey Have Fun * Do Gooders--I've started posting over at WorldChanging: San Francisco about local WorldChanging happenings. I wrote the post below for them, but thought I'd post it here too 'cause Shop Local First Week is a national program. Want to support local businesses in the Mission and save money? This holiday season the Mission Merchant's Association has designated December 4-6 as a time to Shop Local First in the Mission, and created a map and discount coupon that you can download and take with you as you shop. Shop Local First is a program sponsored by San Francisco's Small Business Commission and is being facilitated nationally by the San Francisco-based BALLE (Business Alliance for Local Living Economies. Chicago, Portland, Philadelphia, Salt Lake City, and Washtenaw County, Ann Arbor and Ypsilanti, Michigan are all participating. If you're more of a downtown SF shopper, December 9 is Shop Local First Day. Forty local artisans and craftspeople will be selling their products out on Union Square, and Mayor Gavin Newsom will be there to present the 2006 Most Innovative Entrepreneur of the Year award. If you are looking for a particular gift, check out the San Francisco Locally Owned Merchants Alliance's local business search engine. SFLOMA also has a great list of 10 Good Reasons Why to Shop at Locally-Owned Businesses that you can share on your blog, email list, or with friends and family. Even if your readers don't live in San Francisco, shopping locally benefits their city, too. 1. Significantly more money re-circulates in San Francisco when purchases are made at locally owned, rather than nationally owned businesses: More money is kept in the community because locally owned businesses purchase from other local businesses, service providers and farms. Purchasing locally helps grow businesses as well as the San Francisco tax base. 2. Most new jobs are provided by local businesses: Small local businesses are the largest employer nationally, and in San Francisco provide the most new jobs to residents. 4. Local business owners invest in community: Local businesses are owned by people who live in this community, are less likely to leave, and are more invested in the community’s future. 5. Customer service is better: Local businesses often hire people with more specific product expertise for better customer service. 6. Competition and diversity leads to more choices: A marketplace of tens of thousands of small businesses is the best way to ensure innovation and low prices over the long-term. A multitude of small businesses, each selecting products based not on a national sales plan but on their own interests and the needs of their local customers, guarantees a much broader range of product choices. 7. Reduced environmental impact: Locally owned businesses can make more local purchases requiring less transportation and generally set up shop in town or city centers as opposed to developing on the fringe. This generally means contributing less to sprawl, congestion, habitat loss and pollution. 8. Public benefits far outweigh public costs: Local businesses in town centers require comparatively little infrastructure investment and make more efficient use of public services as compared to nationally owned stores entering the community. 9. Encourages investment in San Francisco: A growing body of economic research shows that in an increasingly homogenized world, entrepreneurs and skilled workers are more likely to invest and settle in communities that preserve their one-of-a-kind businesses and distinctive character. 10. Non-profits receive greater support: Non-profit organizations receive an average 350% greater support from local business owners than they do from non-locally owned businesses. Image credit: San Francisco Locally Owned Merchants Alliance logo taken from Cole Hardware's web site. When eating fruit, think of the person who planted the tree.--Vietnamese Proverb. I have a lot of tree-planters to thank for the fruit I have eaten this year: my husband for being the best hubs ever, my parents for a lifetime of love, my friends for inspiring me, BlogHer and NetSquared for helping me make a living doing something I love (blogging! ), and Have Fun * Do Good readers for their notes and comments that keep me going. I'm looking for a way to celebrate all of the gifts I have been given this year. Last year Michelle Malkin wrote about a Thankful Tree her daughter made in school. Each child cut out a tracing of their hand, wrote what he or she was thankful for on it, and pasted it on the tree. Jana of Once Upon a Family Blog, suggests cutting out leaves from colored paper for each of your Thanksgiving dinner guests, asking them to write down something they are thankful for, and placing the leaves in a bowl, or on a tree at the table. Afterwards she puts them in a Thanksgiving Book along with photos, sort of like a Christmas Memories Book. Another way to celebrate the holiday season is to create a thankfulness journal, and write down one thing every day that you are thankful for, like Aimee of the My Happiness Project blog has done. [I]f we can survive, with our ability to share and to give intact, then the evil and the good will that met that Thanksgiving day in the land of the Wampanoag will have come full circle. Photo credit: Eden Hall Tree by Surplusparts. "I'm not one to rain on anyone's Thanksgiving Day Parade. But, on the first Thanksgiving, the pilgrims did not have the much-loved cranberry sauce at the table. Why? Because they didn't have any sugar to make it with - it wasn't locally available to them." ---from "Keep it Local This Thanksgiving," by Holly Lahd, Minnesota Daily. On its way from farm to plate, food in the United States travels an estimated 1,500 to 2,500 miles, 25 percent farther than in 1980.--from "The 100-Mile Meal," by Kim O'Donnel of the Washington Post. A Thanksgiving meal prepared with local ingredients will not only be fresher and healthier, it will also support the small farmer who pays her workers a living wage, grows a diversity of crops, refuses to use pesticides or genetically modified organisms, kills her animals in a humane fashion, sells her products only within local markets (ensuring that the money stays within the community), and whose children more than likely go to school with your own. You can find resources to plan your local Thanksgiving dinner on the 100-Mile Diet's Thanksgiving page where you can read other readers 100-mile Thanksgiving menus and stories, and check out their Getting Started Guide. Sustainable Table has re-vamped their web site and their Eat Well Guide in time for the holidays. The East Well Guide allows you to search by zip code for farms and stores that sell sustainably-raised beef, pork, chicken, turkey, fish, lamb, goat, dairy and eggs in the US and Canada. It also give you lots of tools to eat locally like an Eat Seasonal page where you can see what foods are in season for your state, and numerous Shopping Guides where you can find CSAs (community supported agriculture), farmers markets and other healthy, local food near you. 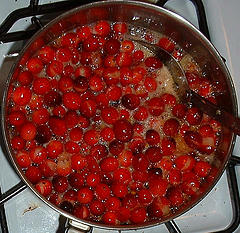 Photo Credit: Cooking Cranberries by Tracy Ducasse. Black Gold is the kind of movie that makes you want to buy Fair Trade certified coffee, chocolate, Fair Trade everything. Now when I see a Fair Trade certified symbol (pictured here), I see two images from Black Gold in my mind: one of a long table of Ethiopian women sorting through thousands of coffee beans by hand for 50 cents a day, and another of a child being weighed at a therapeutic feeding station to determine if he is undernourished enough to receive food. According to Black Gold, a 1% increase in Africa's share of world trade would bring in five times more than what it receives in aid. Black Gold tells the story of Tadesse Meskela, the manager of the Oromia Coffee Farmers Co-operative Union in Ethiopia. During the film Meskela tries to find buyers who will pay a higher price for his farmers' coffee. 67% of Ethiopia's export income is from coffee, so Meskela's story is the story of many Ethiopian farmers. You'll probably be buying and drinking a lot of coffee this holiday season, so please consider buying Fair Trade coffee. According to TransFair USA, Fair Trade means fair price, fair labor conditions, direct trade, democratic and transparent organizations, community development, and environmental sustainability. You can find Fair Trade stores near you and online that sell Fair Trade products by searching on the TransFair USA site. For an extra do * good bang for my buck, I just bought Newman's Own Organics Fair Trade Colombian Especial for our Thanksgiving dinner. Not only is it organic and Fair Trade, but Newman's Own Organics, Green Mountain Coffee Roasters and Coffee Kids are working together on an agricultural program that benefits women in Oaxaca. Green Mountain Coffee also has a cool holiday gift idea for the coffee lovers on your list, a Fair Trade Organic Coffee Tour: two bags of a different Fair Trade, organic coffee each month for six months. Yum. **Oh, and I forgot to mention that you can look on the Black Gold site to see where the movie will be showing near you and California Newsreel will be releasing it on DVD. According to a recent article in Muncie, Indiana's Star Press, "the National Retail Federation expects the average consumer to spend $791.10 this holiday season, up from $738.11 last year." If you're going to spend that kind of cash, why not give a gift that gives back? Global Girlfriend is an online fair trade store that sells handmade gifts made by women's non-profit programs and cooperatives. Microsoft Start Something Amazing Awards Honorable Mention, and was named the 2005 Aveeno Woman with Organic Style. Brazil, Ethiopia, India, Indonesia, Nepal, Nicaragua, South Africa, Thailand, the United States and Vietnam. In the United States, for example, products are made by women from The Enterprising Kitchen and WomanCraft in Chicago, Women's Bean Project in Denver, Appalachian by Design in West Virginia, Thistle Farms in Nashville and Rosie's Place in Boston. I'd love to compile a list of stores with gifts that give back. What are some other online stores where you can buy do * good gifts during the holidays? Photo Credit: Recycled Plastic Beach Tote from Global Girlfriend site. "On average, online givers donate in total (both online and offline) more than 50 percent more than those donors who do not give online." I've been thinking about how bloggers can use their blogs during the holiday season to support organizations that they care about, like Chez Pim has done for UNICEF with the Menu for Hope. My fellow BlogHer co-editor, Beth Kanter, has launched a fundraising campaign using ChipIn. 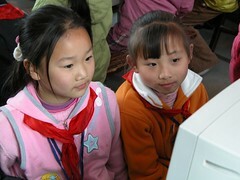 ChipIn allows a group of people to collect money online whether it is for a birthday gift, a party or a fundraiser. Between now and December 31st, Beth is working to raise $750 for the Sharing Foundation, an NGO that works with local officials, orphanages, and NGOs in Cambodia to improve children's lives. She sits on their board. The money is going to support a college scholarship for Leng Soparath (pictured here), an orphan from the Kampong Speu orphanage. $750 will cover her college fees and living expenses. As of this writing, 3 PM on November 16th PST, she has raised 44% of her goal, and she started the campaign ten days ago! "Kiva started out of relationships and love, ideally I would love for that to be present in every single transaction that happens. People connecting." Jessica is the co-founder, with her husband, Matthew Flannery, of Kiva, a nonprofit that is using the Internet to allow everyday philanthropists, like you and me, to loan money to budding entrepreneurs all over the world. She has worked in rural Kenya, Tanzania, and Uganda with the Village Enterprise Fund, and Project Baobab on impact evaluation and program development. She is currently pursuing an MBA at the Stanford Graduate School of Business. You can watch a 16-minute documentary about Kiva on the FRONTLINE World web site. When the documentary aired on Ocober 31st, the response from viewers was so great that it brought the Kiva site down. Below is an edited transcript of my interview with Jessica, which you can also hear on the Big Vision Podcast. Kiva's mission is to connect people, through lending, for the purpose of poverty alleviation. The way we do that is by providing opportunities for individuals from all over the world to lend money to specific, real people, in pretty much real time, through our web site; and we do that by working with a number of microfinance institutions all around the world--MFIs. We find entrepreneurs through our partner MFIs. The entrepreneurs are posted up on our site with their profiles and a word about their lives, their families, and their plans for the business and the money they are requesting. Lenders come to the site and lend any amount from $25 up, in increments of $25. There are 3500 or so MFIs on record, but estimates go up to 10,000. About 70 percent of MFIs, or lending institutions, loan to fewer than 2500 people. There are a few that are a lot larger. There are also nonprofit ones; a lot of them start out as nonprofits and then slowly move toward financial sustainability, and they might turn into a non-bank financial institution, or a number of other kinds of forms along the way. Microfinance, as a whole, is a big category of financial services for the poor: microloans, microcredit, is just one offering, and that is what Kiva focuses on. It is kind of the most well-known and most talked about, and oftentimes it is confused--people say "microfinance" when they mean "microcredit" or vice-versa. In the very, very beginning, Matt and I had this idea like, "How neat would it be if we had individual, real people on our web site with their needs, and the amount of funding that they need? I'm sure we could get people to help them and to loan money to them, so let's just try it." We didn't actually have a specific organization that would work with us besides Village Enterprise Fund, which is a great non-profit. Shout out to them! They do microenterprise grants, not loans; but we worked with some folks that had been given grants and used those successfully, and basically worked with our friend Moses, who listed the seven businesses in the very beginning, put them online, and helped post the information about them. We put them on the web site and within just a few days our friends and family indeed did step up and loaned the money that was needed. So, fast-forward a whole year. We work with a little more than a dozen MFIs all around the world who... let's take Kenya: say there is a head office in Nairobi, and maybe some branch offices in Kakamega or Kisumu, towns all around Kenya. In those branch offices are loan officers. They are the people that get on the motorbike every day, or take the bus, or whatever they do, to get way out to villages where their borrowers may reside. So they are the people that go and actually do the vetting, accept loan applications, do training if there is any--most of our partners do that--and actually distribute the funds, collect the repayments every few weeks, that sort of thing. So they are the people on the ground. In the very, very beginning we were working with people like that, like the loan officers. We just started to work with our buddy, Moses, who is a wonderful man, who was serving in that capacity. But to scale, we knew that it was going to be necessary to work at least a level or two up. So now we work with organizations that employ dozens, hundreds, of loan officers who then go out and find the businesses. Sometimes there will be a designated loan officer within an MFI in one region that is the "Kiva person" that is doing that. Sometimes there will be a few. All of their names are listed on the web site, because we really want it to be, again, a very real and transparent experience. So anything that is posted on Kiva, you will see a name of the loan officer that did that, that day. If an individual wanted to make a loan to an entrepreneur, how would they do that? Go to Kiva.org, and one of the main buttons at the top says "Lend." Click on that and you are able to see all of the businesses that day that are posted, that need funding. Some of them may be close to fully funded, some of them may have just been posted and may have no funding now, but basically you will probably see a number of different businesses, different individuals, who are entrepreneurs that need a loan of, who knows, anywhere from $200-300 all the way up to $1000, maybe. That's about the range that is typical. You can click on them, read about them, and then there is a button that says "Lend," and you can basically, like I said, pick any range--$25, $50 and on up--and using your credit card or a PayPal account, you are walked through the payment process. Then you will get an email soon thereafter that says, "Thank you for your payment. Thank you for your loan. We will let you know when the business starts." Then maybe it still takes a few more days for the rest of the funding to come in for that person. When it does, and when the money is transferred, and that person actually begins their business from the loan that you have helped to fund, you get another email that says, "Great! Jane--the person that you funded, Jane the goat herder in Uganda--is starting her business." From then on out, you will have seen in the loan, the very, very simple, basic loan terms that are on the site next to each entrepreneur. They are each unique, so maybe for Jane's loan there is a nine-month term. Over the next nine months, you would get emails saying, "Hey, Jane made her payment today of $25.00 or $30.00," or whatever her schedule is. She made her payment and here's how her business is doing, and here's a picture of the new goat that she got. Or anecdotal things, like, her kids are in school now, and that's great because they weren't last year, but now she can afford uniforms. Or there's a big celebration because there's a holiday at this time of year in Uganda, and this is what happened. So it's very personal. And at the end of the loan term, not only have you kind of seen the whole process unfold, but as that entrepreneur repays, you get your money back. A vast majority of lenders actually just reloan the money and say, "That was a great experience, I've seen that it works; let's use it again for another business," which is super exciting for us. We get a lot of feedback that says, "I've never done anything like this before." So whether that means they've never gotten involved in a nonprofit operating internationally, whether that means any sort of online lending, whether it means getting involved in something related to microfinance, we're reaching a lot of people that have never gotten involved in something like this before. So that's exciting to us. What is the path that brought you to this work? I grew up in Pittsburgh, Pennsylvania. I have a wonderful family and had just the best childhood and the best growing up. I loved every day. I felt very blessed all the time and I was very thankful. When I got an opportunity in high school to travel a little bit, I went to Haiti with a church group, and that was the first time that I really saw abject poverty. And it just spun my world around; I was blown away. And it was funny because I was a senior in high school, and I came back the week after I had gone to Haiti to see all of this, and experience, and volunteer and serve. I came back and it was prom. [laughter] And it was just like the height of all excess in my life. It was really quite a contrast for me. I grappled with that. It left a really big impression on me. In college, I went on a study abroad program called, "Semester at Sea," and got to see 14 different countries in a period of three months. That also just added a lot of richness and color and depth to my understanding of my place in the world, and what else was out there. I knew I wanted to get involved in something international, but that's not very focused. I started to hone in on international development of some sort, but again, wasn't exactly sure where I fit best. Fast forward a few years, I ended up getting to work at the Stanford Business School. While I was there as staff, I heard Mohammad Yunus from the Grameen Bank. I heard him speak and a light bulb just went off, and I said, "OK, that's it. That's what I want to do." I basically talked to anybody that would give me the time of day over the next year, and found a wonderful mentor and friend and encourager in Brian Lennon, the head of Village Enterprise Fund. Basically, we had lunch every few weeks for that year and I was able to pick his brain and ask questions. Meanwhile, I was talking to a lot of other people as well. Eventually, after that year of research and learning and talking to anybody that I could, I decided I just wanted to go get experience in the field, and that was the best way to jump in. I was so excited to do that. So that's what I did. At that time, I had only been married to Matt for six months, and then I quit my job and I left for three months to East Africa. Kind of a funny time for us. Matt came and visited me. While we were there together, I'm there just being totally compelled by these stories, and so was Matt. But Matt also has more of a technology background than I had at that point, and he really saw the potential for connecting people. We would be out on a four-hour drive, way out in the middle of a village in rural East Africa, but our cell phone would work. It was just amazing to think, what if we left the cell phone here? What if we left a few hundred dollars here for some people that really had some great dreams of doing a business; what would happen? And what would that look like? And how fun would it be to keep in touch with them and watch their progress and encourage them along the way. So that was our vision. A very simple one. Over the next year, we researched, and again, talked to anybody that would talk to us. We asked a lot of questions. We got a lot of positive, and a lot of negative feedback in terms of why what we wanted to do was efficient or not, or would work or not, or was even legal or not. Eventually, we just started, we just tried it, like I described with Moses. That was a year ago, and now we are where we are today. How do you keep inspired and motivated, and not get burned out? Well, where we're sitting right now, I can look around and I can see our team who is absolutely amazing. Every person here is just here because of their desire to be a part of something they really believe in, and they believe is going to change the world. Sometimes, I'll be sitting in class, and I'll know there are six people here every day working full-time to just make this happen, and they believe in it with all their hearts. That's one inspiring thing, but really, I guess there are just so many amazing people involved in this, like the lenders. They care about the businesses, and the comments they write to different entrepreneurs that they funded are ones of hope and encouragement and inspiration, and just support. That's inspiring. There's a 12-year old girl who has been writing in over the past few weeks to encourage an entrepreneur that she funded. And that is just the coolest thing, to think this 12-year old girl cares about somebody she has never met around the world, and is excited for their development. And then, of course, it's really easy to just spend 30 seconds on the site and read the story of one of these entrepreneurs, and just feel so filled with excitement for what you know is going to happen in their lives. Because it's going to be something transformational, it's going to be something that will give them an opportunity to improve their standard of living, and for their kids. That never gets old for me. I spend a lot of time on the site reading those stories and being pretty happy about that. Is there one Kiva success story, even though there are a lot of them, is there one that you can share? There is one woman in the "original seven," in the very beginning that we started off with. Her name is Rose. My Mom (because, of course, at the beginning, it's friends and family doing this with us to just do this experiment, and see what happens and see if it works) my Mom was one of the people who loaned money to Rose and her business. Throughout the course of the loan, Rose had a lot of updates because it was just this really small set, and my mother and others would write in and say Rose, how's it going? I had met Rose before, when I worked there, and I knew Rose had a daughter named Doreen who was paralyzed from the waist down. In rural Uganda, you know, it's mud huts, grass-thatched roofs, and no roads really back where Rose and Doreen and their family lived. I knew that her situation was a tough one, and I also knew that Doreen had never been to school. She was 12 years old and still had never been to school because she couldn't get there very easily at all. There are only a few bikes in the village, and it's really hard even to get her on the bike to get to school. My mom learned about this, and my mom is a school teacher and thought no way, there's no way that this little girl should not go to school. I mean, she's right there. It's just her disability that's keeping her from actually physically getting to school. So my mom was able to send money for Doreen to have a wheelchair, and just a few weeks ago I was back in Uganda and I saw her, and she was in her wheelchair, and she was going to school, and it was a really, really a special thing. So that is one that stands out to me. I should also say this, when I saw Doreen and Rose they looked very healthy. Doreen had grown and was bigger and Rose also was very plump and healthy, which was a good sign. So because of the loan, and because of my mom's gift to Doreen I felt really good about the improvements that they had made in their lives. What else do you want listeners to know about Kiva? OK, one thing is not a touchy-feely thing, and one is. First, three really important groups are served through Kiva, and we really care about all three of these groups. On the one hand, are the lenders. I personally get super excited about the lenders because I love seeing people get really excited about other individual's lives around the world. So that's one group that's being served. It's a sustainable, really high impact, high engagement way to get involved with just a little amount of money. I love that and it's just real. It's connecting with a real person - I guess maybe that's one of my main messages. Kiva is real. It allows you to connect with a real person, and it's specific, and I love that so much. Kiva started out of relationships and love, ideally I would love for that to be present in every single transaction that happens. People connecting. Obviously the borrowers are served because they're getting funded. In the middle, are the microfinance institutions. 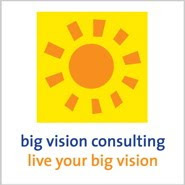 A lot of them out there are great organizations, but their barrier to growth is capital. There are many things that are in the way, but that is a really significant one, and lenders, by providing zero interest, flexible, debt capital, really empower a lot of the smaller MFIs to grow, and to more quickly reach a level where eventually they'll be able to get commercial capital, and access commercial markets. So that's very exciting, because microfinance institutions are a great investment, but unless you're a really rich person, an accredited investor, or a big institution, you can't really invest in them. Even when you can, they are really only the top few, like the top tier that can absorb your investment, especially at that level. So it's a lot of money going to organizations that already have a lot of money, and sure could use more, but there are thousands and thousands of smaller organizations out there that are working hard to serve their communities and to loan money to people and do this wonderful sustainable development, but they don't have funding. So Kiva also serves the MFIs, and I think is really going to change the whole system because Kiva increases the transparency and accountability and gives an MFI an opportunity to earn a great reputation on our site with the public. We are an organization that is doing this work well, and we are repaying our loans, and really paying attention to the development of our borrowers. One other thing - microfinance is not perfect; microcredit is not perfect. There have been borrowers who have not been model citizens. We had an intern go to Cambodia and visit one of the businesses that was supposed to have started a fruit stand. She and the loan officer were surprised to find that the money had actually been used, part of it had been used, to pay for a wedding - the daughter's wedding, and they were slowly going to try to pay off the loan, but they were honest, they said, look, we used some of this money for the wedding, and we're sorry. We're going to do our best, but that's what happened, it's the real deal. We didn't have any other money and this was an important thing for us. So that was written about on the blog for the Kiva lenders to see and it started a really interesting dialogue. It was disappointing, but real, and we love that because we want to encourage transparency and accountability. What advice would you give to someone who has an idea for a nonprofit or socially responsible business that they want to start? My advice, loud and clear, would be just start and try and iterate and there is always a next step you can take. Even if it's a really small one, and it's not the full thing, just start doing it. I will vote the day after a presidential candidate spends a day picking pesticide-encrusted vegetables in a blazing California field. Buying fair trade coffee and family farm-raised food is casting my vote. --Anna Lappé and Sara Littlecrow Russell, from "I Will Vote" in We Got Issues! Last week fifty people squeezed into the Marcus Bookstore in Oakland to hear young women share their stories, their rants, and their issues from a new collection of women's writing, We Got Issues! A Young Women's Guide to a Bold, Courageous and Empowered Life edited by arts activists Rha Goddess and JLove Calderon (pictured here). She stopped me midstory, to ask if I am the babysitter or roommate. My teeth ground in frustration as I reminded her that I am Javier's other mom. and then nina simone, to ask how she was able to keep singing when some days break you of sound. We Got Issues! began in 2003 when Rha Goddess and JLove Calderon went on the road for a year to collect almost 1,000 stories from women ages 18-35 about the things they cared about the most. After collecting the stories, they commissioned a team of young female writers to create over 80 monologues for the WGI! Performance Piece. In September 2004, the piece opened for Vaginas Rock, Chicks Vote at the Apollo Theater in New York, which was executive produced by Eve Ensler, Jane Fonda and V-Day. In 2005, they launched the WGI! Leadership Institute of Arts and Activism. Their work is supported by the nonprofit, Next Wave of Women & Power, or NWWP/1+1+1=ONE. Now Rha Goddess and JLove Calderon, along with the graduates of the Leadership Institute, are on the road promoting the book, performing pieces and facilitating workshops. WGI! just finished touring through Colorado, New Mexico and Northern California. They will be performing in Amherst, MA December 4-9th, and in Chicago, Atlanta and more cities in 2007. 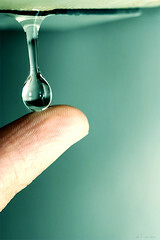 For more info., check out their web site at www.wegotissues.org. Photo Credit: Rha Goddess & JLove Calderon, co-editors of We Got Issues taken by Eli Ceballos. Please vote today for food justice. Please vote for equal access to a good education. Please vote for quality healthcare for everyone. You Won't Feel the Value of It . . .Only When You Lose It! by Al-Fassam. Vegetable Stand by Stacy Y.
ICT's in Education by Peter Morgan. 1999-12 Newcast by Barbara Doduk. "Muhammad Yunus always has said that credit is a human right," Labarthe said, his voice tinged with sarcasm. "Well, I don't believe that. Opportunity is a human right, education--but credit is for the one that has an opportunity to make something productive with that." --Carlos Labarthe, co-CEO of Compartamos. "For Yunus's allies, it demonstrates how the emphasis on profit can blind lenders to social values; the other side worries that rates lowered for political rather than economic reasons probably aren't sustainable." "[M]ost microfinance organizations actually charge high interest rates to cover high transaction costs, and, once specific volumes are met, tend to be very profitable organizations. Other companies – certainly many of those supported by Acumen Fund – take years of subsidy before they move to break-even and financial sustainability." "Omidyar told me that in the two years or so since he became involved in microfinance he had not visited a microfinance institution or met a borrower. Just the opposite of Yunus's entry into microfinance: Yunus left theory behind to listen to the poor, and Omidyar seems to rely largely on theory." As a result of The New Yorker magazine's recent feature on Microfinance and the article review on Where Most is Needed, I took Omidyar Network off one of my client's prospects lists, as it had become clear they are just not a good fit." "[T]he underlying question--What is the best way to help lift poor people out of poverty?--is well worth debating." Photo credit: Money Money Money by Whatknot/Jack. The quote above is from Andrew Taylor's post, "The Rise of the Active Audience," from his blog, The Artful Manager. Over a month ago I told Emily from the Nonprofit Blog Exchange that I would participate in the most recent exchange and write about The Artful Manager. Sorry it took me so long Andrew and Emily! How do professional arts organizations foster and encourage participatory practice in our communities, and is that part of their job? How can we rethink even the most professional of experiences as highly interactive? Or are we working along a spectrum of cultural opportunities that demands we focus even more narrowly on our point in that spectrum? Be sure to share your coments with Andrew here. Andrew's blog is one of 22 Arts Journal bloggers writing about everything from orchestra management to dance to a visual artist's diary . You can subscribe to an individual's blog, or a feed that includes multiple blogs about one topic, such as theatre. I alway find interesting new blogs when I participate in the Exchange. Next time I'll take part sooner! Photo credit: Copilandia-Sevilla-29-12-05-03 by CNT Sevilla.